Happy-Hap #1– Ruth, Ted S., and Michael at Flixchatter share their thoughts on the history of Agent 007 and rank the actors who have played the amazing action agent! A fun look at why we tend to still enjoy and watch James Bond movies as the 23rd installment is hitting theaters next month. Don’t miss the enduring appeal of James Bond in this Bond-based article. -Check it out here: Happy-Hap#1! Happy-Hap #2– Nostra from My Film Views shares his regular weekly segment on Fridays entitled “The Many Faces Of…” In last week’s edition, he shared a look at the many different roles of the one of the most popular actors of late: Ryan Gosling. From The Notebook to Drive to Crazy Stupid Love to the delayed, yet upcoming, Gangster Squad Gosling has been building his career and competes in popularity with the likes of Joseph Gordon-Levitt, Michael Fassbender, and more. Be sure to check out the post and share your favorite roles of his in this dedicated Happy-Hap. Happy-Hap #3– Scott over at FrontRoomCinema wrote his review of The Perks of Being a Wallflower. I have been waiting for this movie to come to my theaters as I am anxiously awaiting to see it. Starring Logan Lerman, Ezra Miller, and Emma Watson, I look forward to seeing what the perks are all about. Based on the best-selling book, check out Scott’s thoughts on this film. Are you looking forward to watching it? Happy-Hap #4– And, in light of the month of October arriving, Morgan over at Morgan on Media has put up a fine series recommending horror flicks to add to your scare-collection this month. (He even updated the look of his page in honor of fall). One of the “classics” he highlights is 1984’s A Nightmare on Elm Street. Did you know that a certain Captain Jack Sparrow was in the film? Be sure to check out his thoughts on one of the iconic horror movies and check out his additional scary movie recommendations afterward! Happy-Hap #5– My friend, Tajuana, over at TajGreeneMoviesInReview has bailed me out! 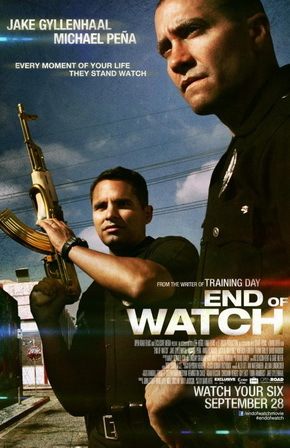 I STILL haven’t gotten a chance to see End of Watch, but thankfully, she has and she posted her review on her site. (Thanks, Tajuana!) This action-filled drama stars Jake Gyllenhaal, Michael Pena, and Anna Kendricks and I need to see it quickly. Don’t miss her thoughts on the film in her review. Happy-Hap#6– Tim from Tim’s Film Reviews shares a look at one of the most classic trilogies of all time (no, it’s not Star Wars or The Godfather): Steven Spielberg and Robert Zemeckis’ Back to the Future. Remember Marty, Doc, and the flux capacitor? You know you do! Check out Tim’s fun thoughts on the entire trilogy in this post. Tell him which of the trilogy is best. And then, vote to choose which Halloween themed movie he will have to enjoy or suffer through and review! Happy-Hap#7– Jaina whose site is appropriately named Time Well Spent, takes a moment to share another passion of hers (aside from movies) and posted some beautiful autumn pictures in a post entitled “The Last of the Nice Autumn Days.” Her photography skills are amazing (you may remember the photos she shared from the premiere of The Avengers in the UK). Thank you for sharing some of your photos! Don’t miss the beauty created by Jaina’s camera! Happy-Hap #8– Max from Impassioned Cinema has a fun segment entitled “Video of the Weekend” (VOTW) on his site in which he shares videos that haven’t been seen by too many people or aren’t as popular yet. In this 21st edition of his segment he shares a cute video entitled “Alma.” Instead of telling you about it, I’m just going to encourage you to visit the page and watch it for yourself. Let me just tell you, you NEED to see it! Enjoy, and thanks for the great finds you always post, Max. Happy-Hap #9– Castor over at Anomalous Material shares the theme for the upcoming movie 007’s SKYFALL that is performed by the highly talented Adele. If you have NOT heard this yet, you need to run over to the page and listen to how appropriately Adele’s amazing voice compliments the feel of 007 so well. I can’t wait for the movie and Adele’s track just made it even all the more exciting. 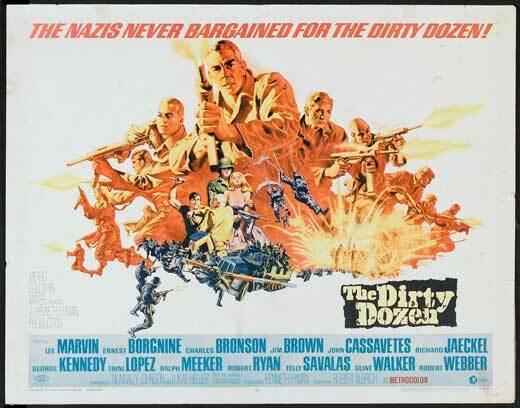 Happy-Hap #10– My friend and fellow movielover, Michael from le0pard13 shares another great installment of his series entitled Friday Forgotten Film in which he shares a look at the 1967 film The Dirty Dozen. This Oscar-winning war drama stars Lee Marvin, Charles Bronson and several others and Michael gives a look at a film that deserves more looks as several other films since have paid homage to it. Don’t forget about The Dirty Dozen. One final note: I am happy to announce that my local television station in collaboration with PRC Productions has expanded my 5 minute segment about movies to a full 30 minute television show entitled “Take 2 With Terrence.” This is an exciting venture and I am glad to share it with you. As an extension of my work on this site, I will be sharing the videos from time to time here. Below is the very first full episode (my pilot show). It’s a lot of work and I am excitedly looking forward to how it grows. Take a watch if you wish. Are you on Facebook? Become a fan today for regular updates! Never miss a post. Stay informed. Spread the word! 🙂 -Click the picture! Seriously though, awesome man. Dont forget us little folks when you’re the next big star, ok?? thanks so very much man. It’s been keeping me very busy on top of my regular work week and the site. But it’s coming together. ha. thanks Tim. We’ll see. It’s fun. Some fantastic links, T. Thanks so much for giving a couple I was involved in a wonderful share. Very generous, my friend. You are a gentleman and scholar. Awesome man. Congrats on the show! Looks good. But when you become a big time critic, don’t forget your early blog supporters! Thanks Morgan! I appreciate the feedback as well. yep, working on it. Pilot show…got plenty more to go and improve. Thanks very much for watching. thanks sir! Glad to share the linklove. How did your weekend end up? Tiring. 🙂 Had some home improvement type stuff to do, errands to run in town now that I’ve got the car back, and wound up watching my nephew Sunday morning. Your own TV show? CONGRATS T! Will have to check it out when I get home tonight. How frigging awesome! I really appreciate the kind words Jaina. It def keeps me busy. It’s small and is working towards even better things, and I am quite proud of it. Oh, thanks so much for the shout out, how very kind! I appreciate the kind words, Ruth. Thank you so much. I will be posting them from time to time, for sure. Glad to always support things over at FC! Thanks for the link love T! You know I love to share that segment of yours Nostra! Always a pleasure my friend. Thank you Alley, that is very kind. Man, i’d be even more nervous if it was national. ha. but it is at least online! Thanks so much for the mention. Fantastic news on your television show. I look forward to watching some of the episodes. Max, I loved that Alma video you posted. a good find. so well thought out. I had to share it. Thanks for the congrats on the show. It is a lot of work but it is getting better. That was just the 1st episode and the 2nd one is even greater. Thank you. Congrats on the expanding TV show! Very exciting stuff! 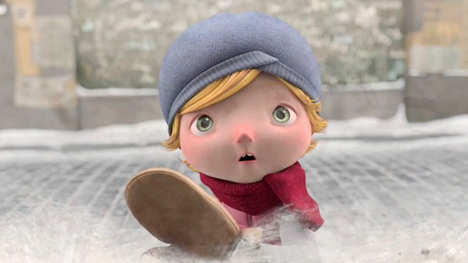 Loved that video of the week from Impassioned Cinema. What a fantastic ending! Thanks Pete! and, yes, that VOTW at Impassioned Cinema is great. I loved it. That ending was perfect. Agreed. Glad you checked it out.